UK Get ready for the 5 star blockbuster comedy play for 2018. 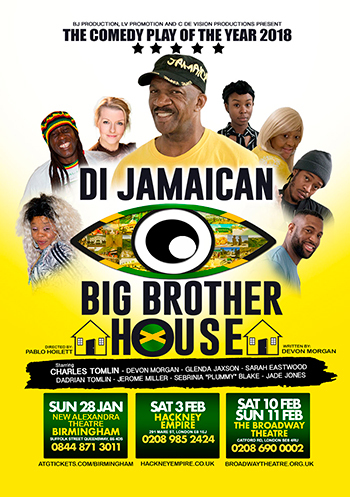 The legendary CHARLES TOMLIN (Daddy Sims) stars in this hilariously funny play “Di Jamaican Big Brother House” which is written by Devon Morgan and directed by PABLO HOILETT for BJ Production. See the shenanigans and goings on in a Big Brother house Jamaican Style and imagine a group of people from all different walks of Jamaican life living in one house for any period of time, the love, envy, jealousy, back stabbing... It's gonna be crazy! Who will be your selected house mate only YOU can decide. Don’t miss this at a venue near you - guaranteed laughter from start to finish.